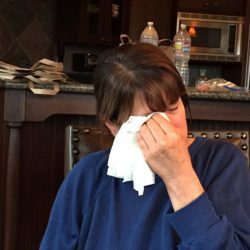 I’m embarrassed to say I’ve never had a Hatch Chile before, have you? 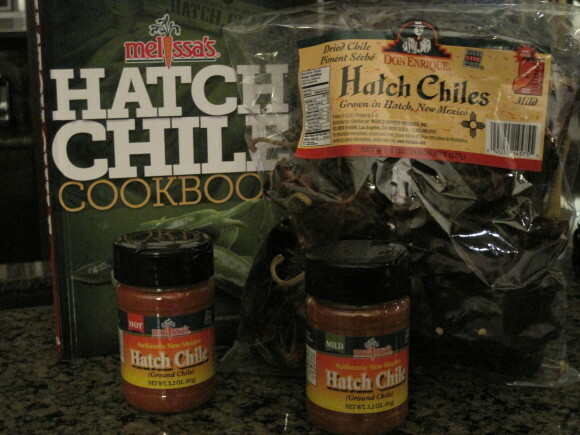 When Melissa’s sent me a bag of their dried Hatch Chiles, Hatch Chile Hot & Mild spice powders along with their new Hatch Chile Cookbook I couldn’t wait to try them. I immediately browsed through the cookbook. There were so many flavorful and unique recipes I didn’t know what to make first. I decided to have my husband look through the book, he selected the Hatch Chile Steak Fajitas, Shredded Beef Burritos with Hatch Chiles, and Huevos Rancheros. I made the Hatch Chile Steak Fajitas for starters, then next week when I receive my fresh batch of Hatch Chiles I’ll make the other recipes. Melissa’s Hatch Chile cookbook has recipes ranging from Breakfast to Desserts & Drinks – I can’t wait to try them. Fresh Hatch Chiles are available for a brief period of time – once a year during August and September. They range from mild to extremely hot, with the mild and medium heat varieties most prominent. Since they’re available for a few short weeks a year, go ahead and order yours now, so you can try them before they’re gone. I rehydrated my dried Hatch Chiles in hot water for about 15-30 minutes before using them in my recipe. However, if you order a fresh batch it’s recommended that you roast them immediately, and freeze them to use throughout the year. A single medium-size Hatch Chile has as much Vitamin C as six oranges. Hot chile peppers are believed to burn calories by triggering a thermodynamic response in the body that speeds metabolism. 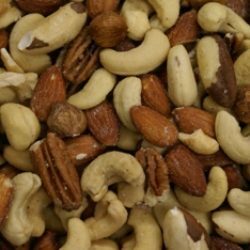 So if you’re looking to rev your metabolism you’ll certainly want to order a batch. Never having tried these before I found the flavor (I had mild dried Hatch Chiles) smooth, and with a wonderful taste that I honestly can’t explain. I wasn’t sure what to expect but was pleasantly surprised. My Hatch Chile Steak Fajitas were so delicious that my family ate every last bit during dinner. Next time I’ll have to make a double batch. If you’ve never tried these before don’t miss out on them before they’re gone. They truly took an ordinary meal and brought it to a new level. Here’s the recipe and don’t forget to check back for more in the weeks to come…. To marinate the steak, in a large resealable plastic bag, combine the meat, lime juice, garlic, lager, salt, chile powder, cumin, oregano, brown sugar, green onions, chiles, 1/3 cup olive oil, and cilantro. Seal bag and shake to mix well. Set bag in refrigerator to marinate overnight if using flank steak or several hours if using Top Sirloin or higher quality steak. Preheat grill to high. Place steak on grill and cook approximately 5 minutes per side or until the internal temperature reaches 160F degrees for medium, or to your liking. 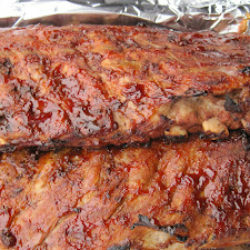 Remove from grill and set aside to rest for 5 minutes before slicing. (This will allow the juices to redistribute). Slice steak into thin strips on a diagonal (especially if using flank steak), and combine with pepper mixture. 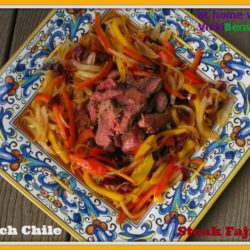 Serve with warm tortillas for delicious Steak Fajitas. They were delicious. I need to double the recipe next time so we have some for leftovers. Neither have I, Vicki. Your sirloin steak fajitas look so delicious! I prefer using a sirloin steak, strip steak or higher quality. Not only can you cut the marinade time but it’s more tender. With flank steak you have to be sure to marinate overnight or in an instant marinater, and be sure to slice the meat on a diagonal otherwise it’s very tough. I’ve never had a Hatch chile before, but this dish makes me want to go out and find them. Looks delish! It was delicious, I’ll be making it again, and again. I love the flavor of Hatch chile! I always order a bunch of Hatch chile powder every year, from New Mexico, and use it to make chili and other dishes. 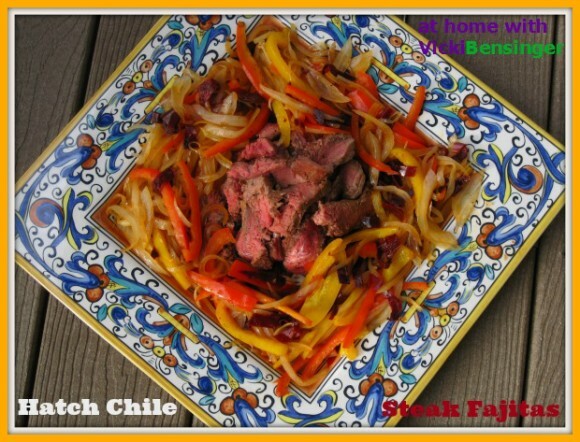 Incredible flavor – I’ll bet these fajitas were wonderful! They were wonderful and Melissa’s also sent me Hatch Chile powder both hot and mild. I opted to use the mild for the first time. Well then I’m embarrassed too but I’m glad you’ve educated me Vicki. These sound fabulous and I’m thinking I need to get on board with Hatch chiles! Yes they’re delicious, definitely worth getting and storing up for the winter. This looks incredible, Vicki! 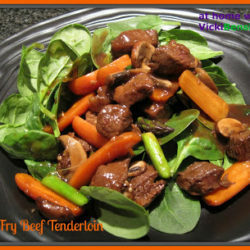 I have a flank steak in the freezer, and I’m going to use your recipe as my inspiration…so yummy!!! Let me know what your family thinks of the recipe if you try it. My family loved it. Your Hatch Chile Steak Fajitas look awesome and so colorful. And wait, I don’t think I’ve ever tried Hatch Chile before either! Can’t wait to get some and give this a try. Sounds wonderful. It’s good to know I’m not the only one that had not heard of Hatch Chile’s before. Quite a few have commented the same. I’m thrilled to have tried them, they’re so flavorful and make your dishes pop with flavor. More embarrassingly ive never even heard of those chillies! Haha but must find them now, this is a beautiful and vibrant dish! You can order them from a link I provided on this post or by going to http://www.Melissas.com. Better hurry though, they’re only available for a short time. My family love fajitas. We always have chicken or beef fajitas – I think it’s one of their favorite dishes. You should give it a try, plus they’re fun to put together. If you’ve never tried fajitas you definitely should, they’re delicious! You are welcome for the food blogging comment – I enjoy it! Great looking fajitas and looks like you really hit the jackpot with that shipment from Mellisa’s. Now that you’ve had the dried chiles, you need to order some fresh New Mexico chile. Producers are shipping right now and it’s SO good! Being a New Mexican it’s always fun seeing people getting turned on to our cuisine. 🙂 Great post! I’ve never tasted a Hatch chili either but I believe our grocer carries Melissa’s brand so I’ll check next time I shop! I love fajitas and this was a delicious way to use those chilis. Hello ! Thank u for your comment. Right now I’m translating my blog to English so within few days u ll be able to understand them. Actually, the newest recipe is already translated, so if u want i can give u the recipe.